Sushi is a dish that anyone visiting Japan should try! This comprehensive guide explains the sushi varieties, how to eat sushi, as well as the manners one should heed. You will also find information on sushi restaurants and even sushi souvenirs! Sushi is a classic Japanese dish where slices of fish or seafood are combined with white rice that has been flavored with vinegar. Standard sushi refers to "Edo-style sushi" and as suggested by its name, it originated in the city of Edo (former name of Tokyo) during the Edo period, and was originally considered to be a fast food! Sushi in the past was also much bigger than it is today, and came in far fewer varieties. We will get more into detail later, but present-day sushi comes in different forms such as "nigiri" (hand-shaped), "maki" (rolled) and "chirashi" (a bowl of rice with various sushi toppings). It had been considered an exclusively high-end cuisine for some years after the Second World War, however around the 1980's when takeaway sushi and conveyor belt sushi restaurants became popular, a new business sprung up that made sushi into a more casual dish. Lately, sushi can even be found in convenience stores and supermarkets as well. Sushi has become a representation of Japanese food around the world and many visitors to Japan come seeking it during their travels. In this article, we will introduce the most important information people should know about sushi. 3. Maguro - What Is It? 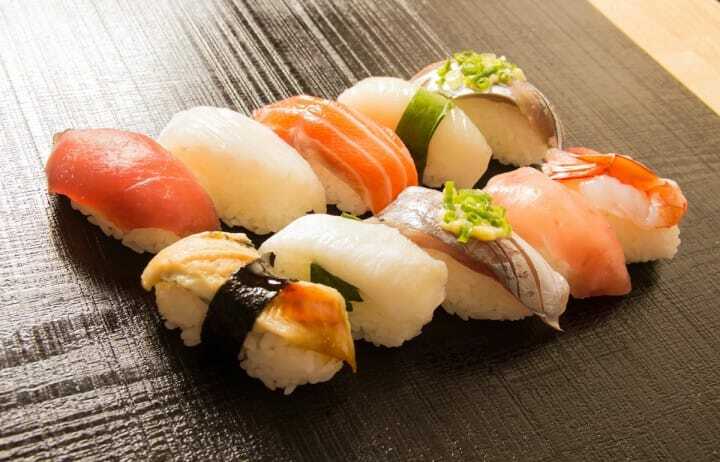 Nigiri is a sushi where a small scoop of vinegar rice is topped with fish, seafood or other ingredients. This is one of the most popular forms of sushi, requiring the masterful skill of a sushi chef. Makizushi is a type of sushi where rice is spread on a sheet of seaweed and various ingredients are laid out and then rolled up together. There are thicker rolls called futomaki with more fillings and thinner rolls with lesser fillings called hosomaki. A famous maki that was created outside of Japan is the California roll. Gunkan maki is a sushi made with a small nigiri sized rice ball that has been wrapped with seaweed and topped with additional ingredients. The name derives from how the sushi looked like a ‘gunkan’ or warship. Salmon roe is usually served in this form. Rice laid inside a wooden sushi bowl or box and topped with a variety of ingredients is called chirashi zushi or bara zushi. Vinegar flavored rice that is stuffed inside abura-age (fried thin tofu slices that have been cooked in a sweet sauce) is called the inari-zushi. Historically, it has been considered to be a food of the commoners and is widely popular among people of all ages. At times it accompanies soba or udon noodle sets. Oshi-zushi is a type of sushi where vinegar rice has been topped with ingredients and pressed together. Common toppings include mackerel, red snapper, and salmon. In Toyama prefecture, there is a regional specialty where oshi-zushi is topped with cherry salmon, wrapped in a bamboo leaf and packed in a special wooden container. Kaki no ha zushi or persimmon leaf sushi is a regional dish from Nara where pieces of salmon or mackerel sushi are wrapped in persimmon leaf and aged. The name comes from how it is served with the persimmon leaf. With countless numbers of toppings used in sushi, this time we would like to introduce the more common ones found in restaurants. A popular topping for sushi is the tuna. Depending on the part of the fish, the name varies from maguro (red meat), chutoro (semi-fatty tuna), and otoro (fatty tuna). We will get into more detail later in this article. Another classic topping that is simple in flavor is the squid. It is recommended to be eaten earlier in the meal. Like the squid, this is another classic that is also popular among small children. This is one of the most commonly known white fish that is also recommended to eat earlier in the meal due to its light flavor. The ones that have a nice amount of fat are notably delicious. A popular topping that has a distinctive scent, but is very tasty. This is also another glossy skinned fish like the Spanish mackerel. There are many types of shrimp used in sushi such as the red shrimp, white shrimp and sweet shrimp. A type of shellfish with a soft texture and bold flavor. This is mackerel that has been cured with vinegar. It has a distinctive taste that may not suit all palates, but many are great fans of this topping. A sushi with an egg omelette on top that is popular among consumers of all ages. Some say that you can determine the quality of the sushi shop just by how the egg omelette is made. Did you know these were the eggs of herring? It is an ingredient that is frequently eaten during the New Year and at celebrations. This piece normally has a special sauce and does not require soy sauce when eaten. It is best eaten toward the end due to its bold flavor. When people imagine a gunkan-style sushi, many think of the salmon roe. This is the fatty portion of the tuna that is made into a paste and is mixed with scallion. Tekka maki is a rolled sushi with the red meat of tuna in the center. It is a popular roll among consumers of all ages. A sushi roll with a slice of cucumber in the center. The name derives from the cucumber being the favorite food of the mythical Japanese creature, the kappa. A classic roll where natto (fermented soy beans) is rolled inside the sushi. A sushi with Japanese pickle rolled inside. This is usually a good type to eat if you want to clean your palate before trying something different. Not everything can work as a sushi topping, but there are plenty of unique toppings found at sushi-go-rounds or casual sushi shops. The great part of sushi can also be how your imagination and curiosity can be tested. And much more. If you find a unique sushi dish, why not give it a try? Perhaps you may like it more than you imagine. Almost every sushi shop carries miso soup. The comforting flavor and the warmth match very well with sushi. A savory custard with chicken, shiitake mushrooms, egg with broth that has been steamed is called the chawan mushi. It is frequently found in conveyor belt sushi. At family-friendly restaurants and conveyor belt sushi shops, there are many types of desserts. Having some pudding, ice cream or even a parfait after sushi is a great way to wrap up a meal.